Looking for something traditional and comforting this Easter? Here is our traditional Easter menu with some of our favorite Easter recipes. If dinner was to be served at our house this year, this is probably what I would make. All the dishes are very quick and easy to prepare and use very easy to find, inexpensive ingredients. 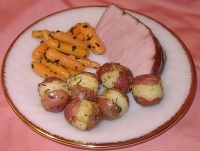 The dinner is based around the traditional baked ham and served with fresh Spring baby vegetables. The meal is quite informal and makes for a great casual afternoon or evening dinner.